Crafters Companion > Blog > Crafter’s Companion Aycliffe Store’s first blog post! Crafter’s Companion Aycliffe Store’s first blog post! Hi everyone! We thought we’d give a update of some of our favorite classes from this week down at the Crafter’s Companion Aycliffe Store! Once again our popular paper flower classes went down a storm! Lead by Sarah , it was great to hear feedback that our guests who intended the classes , would be trying this technique again at home! I think Julia deserves a big shout out this week, despite having badly burnt her fingers she still lead the Christmas card making class and there were some beautiful results. Some of these ladies had never made a card before! Wow. Another amazing week of classes, if you would like to attend one of our classes why don’t you check our booking page , but be quick , places go fast! Or you could call into our store and while your here why not treat yourself to our coffee of the week ? This week’s coffee is ‘gingerbread americano’ ,very festive and warming! Our gingerbread americano goes amazingly well with our cake of the week. Julia R created some fantastic Christmas scones, flavored with cherries, cinnamon and all spice these scones are great with jam! Perfect with Jam! A Christmas Scone at the Aycliffe Store! +On a final note, if your struggling for ideas or not feeling very inspired, we have a demonstration on Saturday the 26th with Jennifer Fisher. Jennifer Fisher is in our Aycliffe store from 10:00am until 4:00pm. 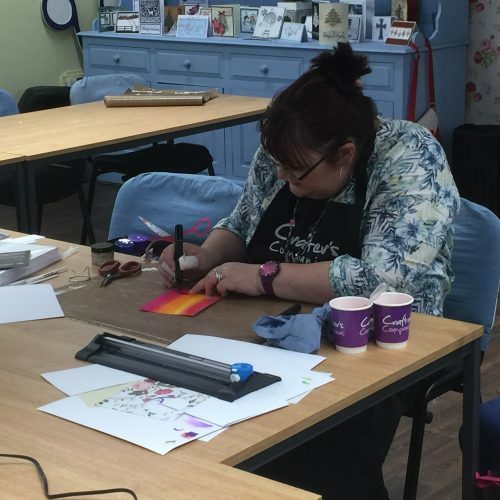 Our demonstration days are a great way to meet other crafter’s and gain some inspiration! That’s it for this week everyone! Don’t forget to like our Aycliffe store Facebook page.